Edit Rivett was an astonishingly productive writer of detective fiction and churned out more than seventy novels under two different pennames, "Carol Carnac" and "E.C.R. Lorac," but regardless of productivity, she had been largely forgotten even by readers of the traditional detective story – until the British Library began to reprint her work. Just last year, they reissued Bats in the Belfry (1937), Murder by Matchlight (1945) and Fire in the Thatch (1946). Murder in the Mill Race (1952) will be released in May of this year. So I decided to reacquaint myself with Lorac and her Chief Inspector Robert MacDonald, because my last read was Rope's End, Rogue's End (1942) and dates back to 2014. I first wanted to go with Bats in the Belfry, but went with Death Came Softly (1943) instead. A decision I have come to regret. Death Came Softly opened strongly when a recently widowed and comparatively wealthy woman, Mrs. Eve Merrion, rents a empty, lavish mansion in Devonshire in order to get away from wartime London. Valehead House lays "miles away from anywhere," in a remote, wooded valley, with a large, colorful garden full of beauty and neglect. The forty-some room mansion was erected in Georgian times, but this secluded back wood is smudged with the fingerprints of "men of the stone age, Romans, early Britons and medieval charcoal burners" – all of whom have inhabited the valley in previous times. A notable landmark is "an airy, commodious and generally desirable" cavern known locally as the Hermit's Cave. Mrs. Merrion manages to pack this large mansion with family, staff and guests. There's her elderly father, Professor Crewdon, who's an anthropologist interested in archaeology and had been "simply aching" to find a quiet spot to write his magnum opus. He would bring along his studious, owl-faced secretary, Roland Keston, and his two servants, Mr. and Mrs. Brady. Emmeline "Emma" Stamford is Mrs. Merrion envious sister, who had married an officer in the Indian Army, but barely has any money and has to count her threepence's for a taxi ride. Something that's bound to cause resentment ("it's simply not fair"). The household is rounded out by two live-in servants, Mr. and Mrs. Carter, but Mrs. Merrion is also entertaining two house-guests. A world traveler, Bruce Rhodian, who wrote a book about his "journey over the Andes" and a modern poet, David Lockersley. These opening chapters are easily the best, most vividly written parts of the story and the secluded valley with its wild, natural splendor and lonely mansion becomes a place you would like to take peaceful stroll, but slowly grinds to a halt when a murder occurs – a rather ingeniously imagined murder. Professor Crewdon has developed the habit of sleeping on the stone bed in the Hermit's Cave, but is found dead one morning without a mark on his body. A medical examination revealed that the professor had died of carbon monoxide poisoning caused by glowing charcoal. A brazier was found in the cave and there was plenty of charcoal, but Chief Inspector MacDonald is faced two problems: the cave was naturally ventilated and, if it was accident, how was the charcoal ignited when the professor only had a matchbox on him. This makes him think the professor was murdered. Admittedly, the gimmick used to commit the murder was clever and something you would expect to find in a Detective Conan story or perhaps even in a John Rhode novel. Although Rhode would probably have improved and elaborated on the gimmick tremendously. The identity of the murderer and motive were competently handled, but everything between the vivid opening chapters and solution became increasingly dull, lacked inspiration and even the setting had lost their shine – making it a trudge to read. Hell, even the characterization became as thin as paper in the second half. This stark difference between the opening chapters and the bogged down, post-murder section reminded me of Ngaio Marsh. Something referred to in these parts as "Dragging-the-Marsh." A good portion of Marsh's detective novels consists of two sections: a lively written, properly characterized novel of manners often with sophisticated, cultural backgrounds and flat, humdrum second half. This part usually consists of a series of unexciting interviews and lumbering around the scene. So I have not much else to say about Death Came Softly, because the book is guilty as hell of dragging-the-marsh. 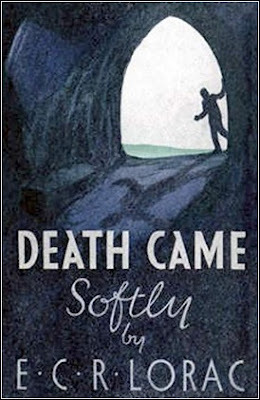 So, in summation, Death Came Softly opened promising with a solid premise set against a beautifully painted background, but the plot was unable to sustain itself in the second half and the characters, as well as the setting, lost all its color. Chief Inspector MacDonald was even more colorless than I remembered! The plot was decent and the murder-gimmick was clever, but hardly enough to recommend the book as a whole. Well, this was turned out to be rather disappointing, but don't despair, I'll give Lorac another shot one of these days with Bats in the Belfry or Murder in the Mill Race. However, my next read is going to be a long overdue return to the detective fiction of Helen McCloy. A lot of Lorac's awfully stodgy; she's like a cross between John Rhode and Ngaio Marsh, with the worst aspects of both. I've read a dozen or so of hers, and haven't come across an outstanding one. That's not very encouraging, but my experience with Lorac has been the same. Rope's End, Rogue's End was decent enough and liked the (post) wartime setting of Murder by Matchlight and Fire in the Thatch, but nothing outstanding or memorable. I'll still be giving Bats in the Belfry a shot and The Double Turn is still on my locked room wish list. In total agreement on this one. A dud. but I like Lorac better than Nick. Oh, sure, I recommended a number on one of the comments innone of my Lorac pieces. I’ll send a link. The Double Tuen was one! I remain curious about Lorac purely on account of the uncommon ways she approaches what should be fairly standard problems: Bats in the Belfry is a great example, as is The Devil and the CID. Sure, she'll have some duffs -- Slippery Staircase, Black Beadle spring to mind -- but for what you'd term a "second-stringer" she's a darn sight more interesting than most. This one, however, I shall trust you and avoid. Got The Sixteenth Stair up next for her, I think, and I remain very curious to try Rope's End and The Double Turn. I also enjoyed Murder of a Martinent and Murder in the Mill Race and Policemen in the Precinct. Thanks for the recommendations, Curt! I'll keep them in mind.